Let me start by saying up front that rpgKids is probably the best 3$ you can spend in beginning to foster the love of RPG’s in a child. Mr. Enrique Bertran (aka @NewbieDM) sent a call out to fellow gamer dads on twitter a few weeks ago, so I felt complied to answer him. After speaking to him I was given the honor to play test some of this delightful project before it came to the masses. I had been familiar with his rpgKids system only vaguely before this, having glanced over it a time or two. When it came to “playing D&D” with my son before it had always been some malformed abbreviated form of 4th edition I hacked up on the spot, no consistency. Thankfully with rpgKids that’s now a thing of the past and he has a simple yet understandable system to play with rules anyone can pick up within minutes. This evolution of the system (1.5) is somewhat of a re-vamping of his rpgKids system he’d release a year or so ago. He’s made additions, changes, and clarifications as well as extra optional rules for magical items and bonuses/penalties during combat only to name a few. Also added in are special non-combat abilities for each of the 4 class archetypes which are the Sword Fighter, Healer, Archer and Wizard. The system is so simple and so easy to pick up I believe it could be used as a gateway not only for kids but even those non-gamer adults we all have in our lives. The rpgKids rulebook is 24 pages, comes with everything you need to begin playing immediately and also provides printable grids for creating your own maps and tokens for heroes and monsters. Therein he’s also included a full blown adventure entitled “The Lair of the Frog Wizard” which is a sizable little adventure complete with flavor text and ready to print maps of the locales within the story. The artwork for maps and print outs is very child friendly and somewhat simpsons-esque if you ask me, all hand drawn in crayon. Hopefully these will spark kids’ imaginations into maybe even drawing some of their own. The visual style inside the manual itself is reminiscent of older RPG publications filled with medieval themed black and white drawings. Also included is a page of character sheets that fit 3 per page, each has plenty of space available for a portrait to be drawn in so hopefully this too encourages little ones to have a blast creating something entirely of their own. My son and I had a blast playing together; he decided that my wife’s wizard had 2 spells which were a fireball, and a magic fist. While at GenCon he had made sure that we stopped at a mini-booth so he could pick one out for “his hero” as he always opts for the Sword Fighter, he finally got to use his mini from the convention. He was the first one to suggest doing things out of context that he saw on the dungeon tiles such as hopping over a table and picking up a treasure chest to smash into the bad guys, all priceless to me as a father. His creativity has always been vibrant but while playing this it seemed to really flourish, so I really encourage playing rpgKids with him and we try and play at least once a week. The basic math skills required by the rpgKids system is great, and simple enough that my son (just turned 4) quickly started catching on to how it worked and now he’s really doing good with double digit numbers too. Another point I must stress before closing is that if we as gamers do not get our kids, nieces and nephews, brothers and sisters (you get the idea) or at least some capacity of young people into RPG’s the hobby will die with us. There are more than enough grognards out there to go around spitting poison and hatered to ruin communities, so we need to bolster our ranks with faithful little role players.We need people who take joy in gaming and have fond memories of it regardless of version or mechanical semantics, but simply because “it’s fun”. This is a great way to begin planting those seeds for future and current generations. 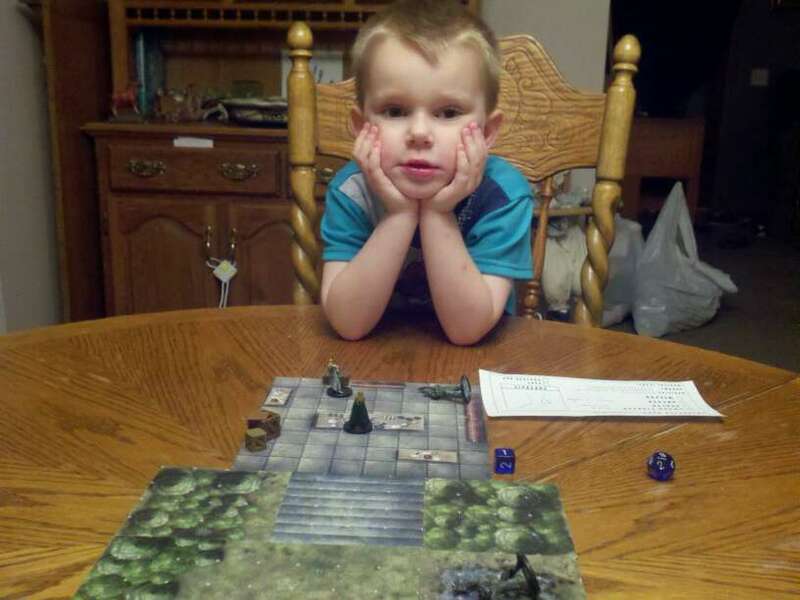 There is so much competition vying for the attention of our kids these days and if playing RPG’s isn’t included in the myriad of options they have, then the hobby will surely fade into the ether eventually. I cannot express how helpful and fun this system has been, it’s great that somebody out there has created a system specifically for kids. But don’t listen to me, just google “rpgKids” to see what all the buzz is about, it’s even made it to the big time with a GeekDad article over at Wired.com. You can pick it up at RPGNow for 2.99 as we speak, and be sure to visit NewbieDM.com for even more details and always great D&D articles, all from a fellow gamer dad who always goes the extra mile. Also check out the video below for some rpgKids in action from NewbieDM himself.